This research was aimed to know the phosphorus availability in rice fields based on use intensity in Sub District of Gerung West Lombok Regency. The research conducted from February 2018 until April 2018 with 3 location criteria (Less Intensive, Intensive, Very Intensive). Method which used is descriptive method with survey technical. The results showed, the phosphorus availability on intensive rice field in all criteria location is range from high to very high containing. The land use with very intensive (3 times plant) indicate very high accumulation of nutrient P with the range 85% of the land area was researched. Correlation of using SP36/TSP with availability of P in each location criteria have a positive relationship and which have a very strong correlation ( r = 0.994) that is in Less Intensive location. HABIBURRAHMAN, Habiburrahman Habiburrahman. hr KETERSEDIAAN FOSFOR PADA LAHAN PADI SAWAH BERDASARKAN INTENSITAS PENGGUNAANNYA DI KECAMATAN GERUNG KABUPATEN LOMBOK BARAT. 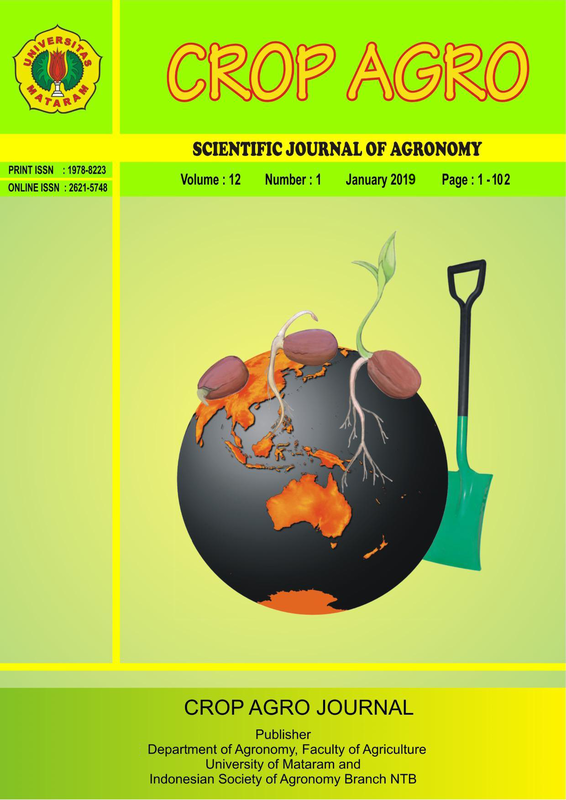 CROP AGRO, Scientific Journal of Agronomy, [S.l. ], v. 12, n. 01, p. 90-102, mar. 2019. ISSN 2621-5748. Available at: <https://cropagro.unram.ac.id/index.php/caj/article/view/251>. Date accessed: 19 apr. 2019. doi: https://doi.org/10.29303/caj.v12i01.251.